We Be Reading: 2nd Annual DWJ March Begins Today! 2nd Annual DWJ March Begins Today! 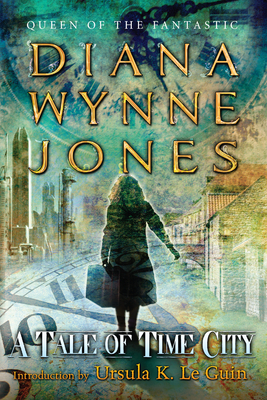 Welcome to our second annual Diana Wynne Jones celebration, a.k.a. DWJ March! I will just mention briefly that this event began last year as a way to turn mourning to celebration on the first anniversary of Diana's death. She is still greatly missed and we wish her time with us had been much, much longer. Thankfully, we can still explore the wonderful worlds she created! At the start of each week, expect a Reflections on Sunday post from me. 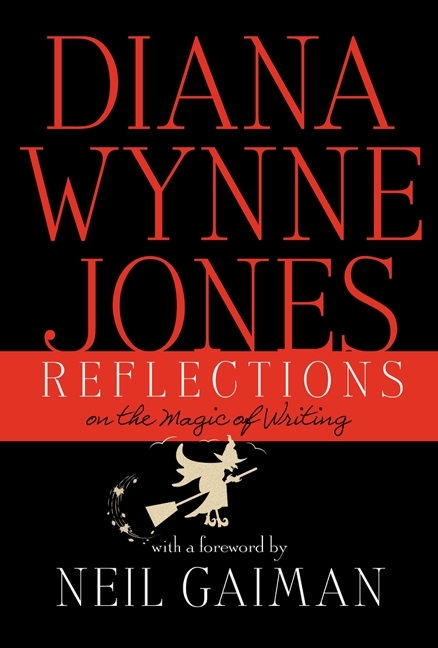 I'll be reading Reflections: On the Magic of Writing, and will share quotes, passages and/or thoughts each Sunday. If you've already read this book or are planning to and would like to participate on your own blog, feel free! I'll post links each week if anyone else participates. Next, I'm very excited to have guest posts every Tuesday and Thursday from other DWJ fans. I'm not alone in my love for Diana and I'll prove it! We're also going to have two read-alongs! 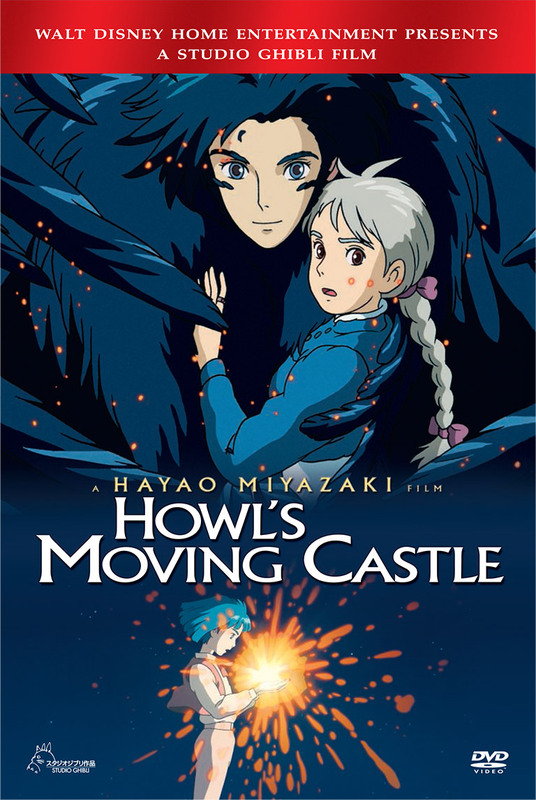 Beginning March 15th, be ready to discuss Howl's Moving Castle. Whether you're reading it for the first time, re-reading it for the umpteenth time or even if you just want to stop by and discuss fond memories of the book, you're very welcome here! And beginning March 29th, come and ponder the complexities of A Tale of Time City with us. I wasn't entirely sure what all had happened when I finished reading it the first time so I'm looking forward to a reread. I would also like to have a watch-along of the Studio Ghibli film of Howl's Moving Castle on March 16th/17th on Twitter. To try and include as many of you worldwide as possible, we'll have two viewings and a nifty hashtag -- #howlalong. Finally, there will be giveaways! Look for those to pop up throughout the month both here and on other blogs (I'll link to any other giveaways). Now that I've assaulted you with exclamation points and a ridiculously long list of events, I'm going to ask a favor. 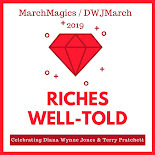 If you read any DWJ books this month or have any DWJ thoughts/feelings to share, please write up a post and send me the link. 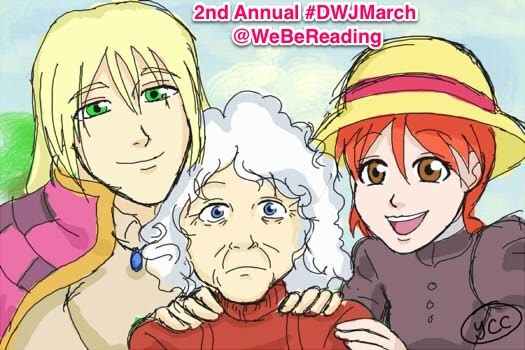 And if you're discussing DWJ on Twitter, use the #dwjmarch hashtag so we can all join in. Let the DWJ celebration begin! What a great idea! I'll see if I can do something for DWJ March! In the mean time, you might enjoy this post I did for her birthday last year: http://www.goldeenogawa.com/reading-chrestomanci-600/ It's my introduction for non-fans to the worlds of Chrestomanci, though it may be of interest to folks who've already read those books. That was a beautiful post! I would love to reread the Chrestomanci books in your recommended order. I've only ever read them chronologically with the short stories last. I'm so glad you're joining the event! I'm so glad that you decided to do this again! I need to get out my copy of How's Moving Castle. This is exciting! I love Diana Wynne Jones. Me too! This event just makes me so happy and I'm glad to share it with so many of you! Woohoo! I just finished reading Changeover and am trying to figure out what to say about a book that, like, nobody else can ever read because that's how out of print it is. 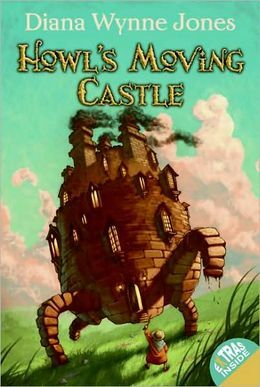 :p And I'm definitely putting a post up about Howl's Moving Castle because I love it so much, but I have to reread it first. Aw Howl. I love it the best when he's so angry about his family. Aw. I can't wait to hear what you say about Changeover. I'm sure I will try and find a copy of it some time. I'm excited to hang out with Howl again too. I'm going to have to think of something intelligent to say in my post instead of just swooning over Howl. I've just started The Pinhoe Egg, which I'll probably review for my guest post . . . unless I can't stop reading DWJ and write about something else! Sounds like fun! My daughter has been steadily making her way through DWJ's books. I've only read a few (Howl, one of the early Chrestomanci books, and Enchanted Glass) but I've found them charming and whimsical, and plan to read more. I've started following your blog, not only to keep up with your DWJ month but because you, like me, read and review a range of books and genres - and we have several tastes in common. I invite you to stop by and visit The Bookwyrm’s Hoard. Did your daughter find DWJ on her own or did you steer her toward the books? I just wonder if kids are still discovering DWJ on their own. Sadly, her books seem to come in and out of print so you don't always see them at bookstores. Luckily, libraries seem to stock most of them (though the covers may be old and less appealing). It's many months from now, but thought I'd mention that the DWJ mailing list sponsored a bench at the 2014 World Fantasy Convention, LonCon 3, in honour of DWJ. Rumour has it that the bench's plaque might have "I belong to Chrestomanci Castle" engraved on it. Is it wrong of me to be inspired to travel to the UK for the first time just so I can take a photo of a bench? I'm trying to read more DWJ books as they come to hand, and posted about Archer's Goon today (https://necromancyneverpays.wordpress.com/2013/03/13/archers-goon/). With any luck, I'll read another one this month--I obviously missed something by not knowing about this author when I was young! Fantastic! I'm including it in my post round-up tomorrow.